Il registratore comandi può essere usato per registrare tutti i comandi inviati da Rocview al server. Opzione orario; deve essere attivata prima dell'avvio della registrazione. Non tutti i comandi sono supportati. Reset all involved blocks from occupancy. Click on the start block. → Use Shift+Click for choosing the plus block side. Click on all needed switches, signals and sensors. To get the wanted command correctly in the route use the context menu instead of a single click to select the right command. Click on the destination block. → Use Shift+Click for choosing the plus block side. Optional click on the crossing blocks. Optional modify some recorded lines. The new route will be shown in the Route Dialog to be able to make some changes or set options if needed. After pushing the OK button the recorded route will be send to the Rocrail server will show up in the Route Table. With Cancel the recorded route will be rejected. Works with Standard and with Staging Blocks. Steps 5 and 6 may be mixed. Pause lines will be ignored. 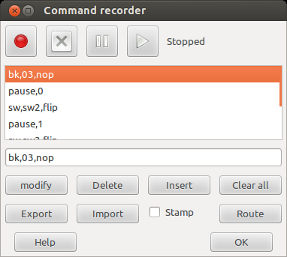 If some switches and/or signals were left clicked the correct commands can be adjusted in the Route Dialog. La "Pausa" non è un comando ma è usato per attendere un numero di secondi tra i vari playback.